The Health Insurance Marketplace’s virtual grand opening is October 1, 2013. However, many people don’t realize that the Exchanges aren’t the only game in town. You are able to purchase off-Exchange plans as well as the Affordable Care Act Bronze plan, Silver plan, Gold plan, and Platinum plans. 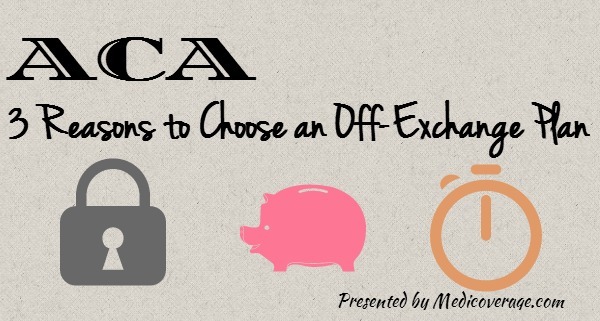 We’ve listed 3 reasons why an off-Exchange may be the right choice for you. Off-Exchange plans are both grandfathered plans (plans enrolled in prior to March 23, 2010) and plans that are not purchased through the Health Insurance Marketplace. The main reason to purchase an on-Exchange plan is if you qualify for ObamaCare premium subsidies and/or federal cost-sharing subsidies. If you don’t qualify though, you might find a better value in plans offered off the Exchange. The reason for this is off-Exchange plans may be able to offer extra benefits not found on the Exchange, as well as they may offer lower premiums. An Exchange plan takes a long time to gather all of your financial paperwork, as well as the time to fill out the application. If you know you don’t qualify for subsidies then you can save time by purchasing an off-Exchange plan. Part of that paperwork you need to gather for apply for Exchange plans are your W2, child support, alimony, assets financial statements. This information is put out there. So, again, if you know you don’t qualify for subsidies, might as well protect your privacy with an off-Exchange plan. Remember an agent or a navigator can help you with the on-Exchange plans, but only agents can help you with your off-Exchange plans. To learn more about plans outside of the Exchange or for the new metal plans call 800-930-7956 or contact Medicoverage.